How do you know if you’re “ready” for yoga teacher training? “It’s a terrible thing, I think, in life to wait until you’re ready. I have this feeling now that actually no one is ever ready to do anything. There is almost no such thing as ready. There is only now. And you may as well do it now. Generally speaking, now is as good a time as any.” – Hugh Laurie, actor. I can’t help but wonder, how many phenomenal new teachers are out there today, sitting on the fence waiting until they’re ‘ready’ to teach? When there’s no perfect time and no shortage of legitimate sounding excuses for why it can’t be this year. The universe is always ready for you to do what you were meant to do. It’s your mind that’s stuck, perpetually waiting to work up the courage to make some real changes in your life. Jokes –-and the lure of going to work in cute yoga pants – aside, changing careers is scary. Starting over is scary. Doing something new for the first time, like teaching a yoga glass, is scary. But what’s more scary is never doing those things that could ultimately bring your soul home, because you didn’t ever feel quite Ready enough. If you’ve been seriously thinking about doing a yoga teacher training, in the words of Nike and motivational speakers everywhere, just do it. The mere act of signing up breaks the inertia of your life and gets the ball rolling. Slowly all the logistics fall into place. You find that getting away from your daily life for two weeks isn’t that impossible, and that flights to Costa Rica aren’t that expensive. On the first full day of training, you don’t feel completely Ready for that 6am morning practice, or for meeting 40 new people who can all presumably do a better headstand than you. But then you get to know them over the next few days, and you realize they’re amazing people just like you who all overcame their own “I’m not ready” excuses to be here with you. Some of these amazing people will be part of your life forever. People whose lives and backgrounds seem so different from yours on paper, but whose hearts and paths are now beautifully entwined with yours. You realize you’re all there in search of change and transition. 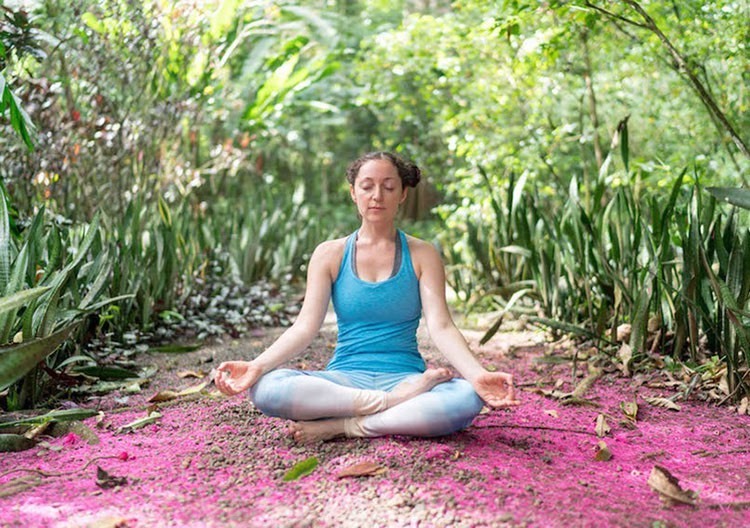 On the surface you’re there to learn how to teach yoga, but you end up learning so much about yourself, feeling like you stumbled into a much-needed “soul rehab” center in the middle of the rainforest. Before you know it, those intensive weeks of training are over. You’re suddenly not Ready for it to be over. But you have no choice, so you go back to your “normal life” and find it still exactly the same as you left it, except now YOU’RE different. The way you see the world has changed a bit, brightened and sharpened enough to see that you’re exactly where you’re supposed to be. There’s a lovely ancient proverb that echoes Hugh Laurie’s musings on readiness: The best time to plant a tree was 20 years ago. The second best time is now. Do yourself a favor and plant that tree at the Goddess Garden in Costa Rica with Marianne Wells. She’s always ready for you. Love everything about this post…and how much it resonates with me is uncanny…thank you for this beautiful article I’m feeling more ready for our January training more than ever.